Sources say while the watch remains unnamed, the display is rumoured to measure 2.5-inches diagonally and ‘is slightly rectangular’. Also being mentioned is a touch interface and wireless charging, plus a watch face that extends out slightly from the band to create an arched shape. The unnamed source estimates 50 million units are expected to ship within the first year of the release, as the watch is currently in trial production at Quanta Computer, the main manufacturer set to make 70 percent of the final production. Again, sources say the official could be as early as October, echoing previous rumours. A third source to the story says LG Display is the exclusive supplier for the smart watch’s screen, set to be used for the initial batches of the device. LG was rumoured to supply a flexible OLED display for the iWatch since last October. Other separate sources claim a heartbeat monitor will be integrated to measure a user’s pulse, a feature to be supplied by Heptagon, a Singpore-based sensor maker. 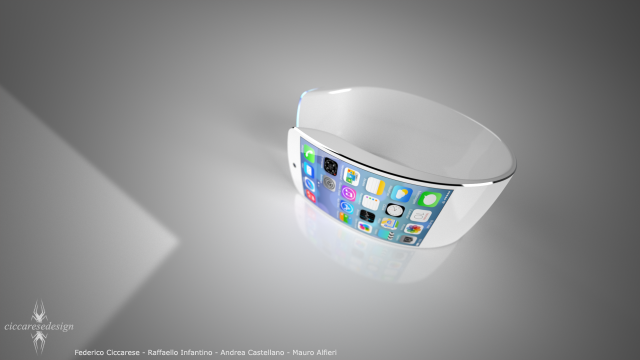 Quanta was rumoured to have landed iWatch production last August, alongside Inventec. Re/code reported earlier this month Apple’s iWatch is pegged for an October launch and will take full advantage of HealthKit, the company’s foray into fitness tracking.